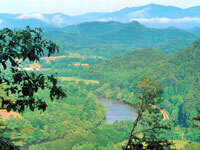 East Tennessee is best known for the cities of Chattanooga and Knoxville. Near the border with Georgia, Chattanooga features a revitalized downtown, and popular attractions, including the Chattanooga Choo Choo and numerous Civil War battlefield parks. Just outside of Chattanooga, you can visit Lookout Mountain and Ruby Falls. Rock City Gardens features a 4100ft walking trail, a 90 foot waterfall, a 180-foot long suspension bridge, and Lover's Leap where you can "see seven states." Knoxville features the site of the 1982 World's Fair, a lovely downtown featuring shops and historic buildings, and plenty of theatre and music options. East Tennessee features many small towns and outdoor attractions, including Lost Sea in Sweetwater, America's largest underground lake, and Norris Dam State Park, the site of the first Tennessee Valley Authority dam.